When the Beatles' record company tempted their producer out of retirement for one last project, no-one had any idea how radical the resulting album would be. 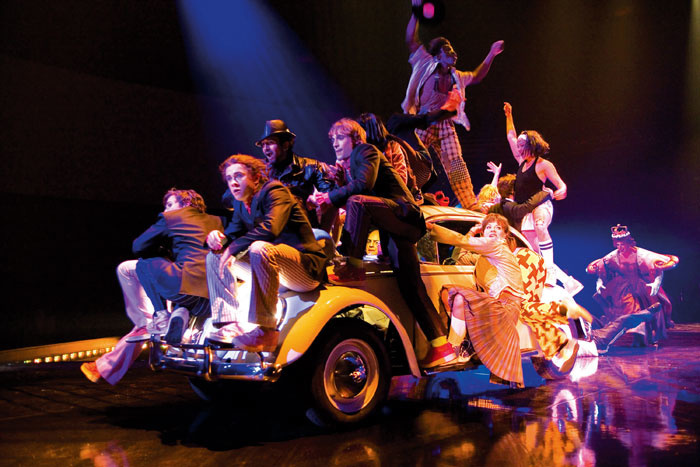 Part high-concept mash-up, part elaborate restoration job, the Beatles' Love was originally conceived as the soundtrack to Cirque du Soleil's Las Vegas show, but became much more. Upon its release as an album, listeners were invited to play spot-the-elements, as well as to hear new mixes of classic recordings. 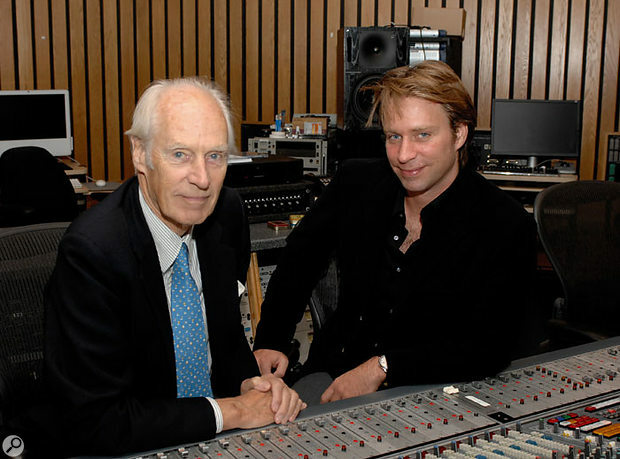 The project also marked the first collaboration between George Martin and his son Giles. The legendary producer, who turned 81 in January, had in fact gone into retirement, but the thought of returning to the Beatles' masters proved too tantalising a prospect. "It's a funny word, 'retirement'," he says. "Because it suggests you're giving up everything, and I certainly haven't done that. But I've given up recording, because my ears aren't good enough. This, however, was an offer I couldn't refuse, when they asked me to produce the music for the show. It was such a challenge. But I couldn't have done it without Giles. He's my ears." "He refuses to get old, which is great," laughs Giles. "I would rush forward and do stuff, then find myself lost without him. Even though his hearing is bad, he has a great ability in his brain to work things out." "One day," George recalls with a smile, "I was apologising to Giles because I couldn't hear the top. He said 'Dad, how many 80 year-old people do you know who're experts in sound?'" Martin joined EMI as a producer in 1950, initially working mostly on classical recordings. "But of course you'd have to chop up the music into little bits and pieces," he explains. "Four minutes, 15 seconds was about the length of a disc. So if you've got a 15-minute overture, you have to chop it up into four parts. You, the producer, had to tell the conductor where he should end. You had to say 'I think the good place is bar 191, but resolve the chord so it doesn't sound too bad, and when we start again we'll start with that chord, OK?' And that's the way you did it." Branching out into comedy recordings with the likes of Peter Sellers and Spike Milligan and enjoying crooner hits with Matt Monro, Martin was on the lookout for a rock & roll band when Brian Epstein brought the Beatles in to audition. Three years later, in 1965, when his contract with EMI expired, he made the shrewd move into independent production. "I was forced into it," he recalls. "Before I met the Beatles, I had been lobbying my bosses, saying 'I want some kind of recognition of the sales I'm achieving. Your salesman are getting a commission on their sales. I'm making the damn things and I'm getting nothing.' I was on a salary of £3200 a year, no car and nothing else. When the Beatles came along I was making a fortune for EMI." Sitting in the small studio ('At the end of the corridor next to the loos,' Giles points out) in Abbey Road where the majority of the work on Love was done, I wonder if it's strange for George Martin, returning to a building where's worked on and off for close to 60 years. "Well, the building itself hasn't changed at all," he states. "Number Two studio is very, very similar to the time with the Beatles. The control room is different: when I first came here, the control room of Number Two was on the ground floor because we didn't have tape machines then. We had lathes in the control rooms cutting discs. We had to wear a suit and a tie and the engineers wore white coats. Nobody sat down. We did have tape machines but they were considered to be rather inferior, which they were. Because the tape in those days was pretty raw stuff and the signal-to-noise ratio wasn't very good so you got a hell of a hiss, which you never got on the disc. The disc was a very clean sound. And of course everything was mono: 78rpm shellacs, which were breakable." Photo: BBC Library/Redferns Something that both producers agree on is that Ringo Starr is the star of Love. "Listening to this recording, he drives that band right through the show," says George. "Fantastic stuff. And it isn't just the technique of playing the drums, but it's also thinking up what he's going to play. If you listen to 'Come Together', for example, his work on that is very, very thoughtful and very clever. And the stuff he did on 'Day In The Life' with the toms... magic." "It's great that his drumming has come out so well," Giles agrees. "He's not even louder, it's just I guess his drums are slightly bigger than they were. 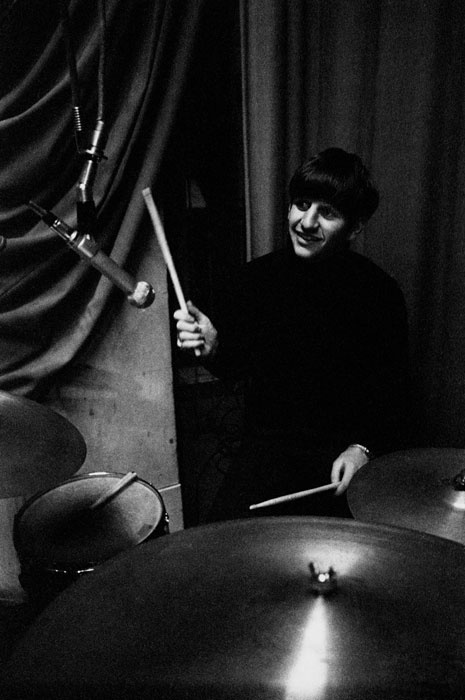 I've had the ability to take Ringo off the Beatles' records and put them back on, and the great thing is that he plays stuff you wouldn't imagine a drummer playing. As a producer or a musician, you can go 'Right, what would I have the drummer doing now?' And it's never what Ringo plays." It's incredible to think that George Martin has been working with sound for so long that he's not only seen shellac made obsolete by tape, but has watched tape lose out to DAWs. "Isn't it incredible?" he says, gesturing towards the Apple Mac studio display. "He finds it amazing what can be done," says Giles. "At first he said 'Why don't we use tape?' I said 'Well Dad, you know I'm enthusiastic about that world, but we couldn't do this on tape.' The way that we worked was I would do the chopping and changing and play it to him and he sort of produced me doing it. One day he watched me grab something and turn it around and he said 'My God, sound is like putty nowadays, you can just mould it into any shape you want.'" "The brief on this show," George says, "was that I should use all previous recordings in any form I wanted. It gave us carte blanche to muck about." Preliminary work on Love began in November 2003, when Apple Records' Neil Aspinall gave Giles a brief to create a mash-up demo of 'a gig that never happened,' using elements of the Beatles' catalogue. The resulting 13-minute piece comprised the opening section of Love, from the 'A Hard Day's Night' guitar chord through to 'Get Back', a 5.1 mix of 'I Am The Walrus' and his clever pasting of 'Within You Without You' over 'Tomorrow Never Knows'. Speaking of the latter, George says "It was Giles's idea and he did it without my being here. I thought, fantastic. So did Ringo, he thought it was amazing." "To begin with," Giles continues, "it was just going to be the Beatles remixed, and the idea of chopping and changing didn't really come to fruition until we tried stuff out. Apple are the four Beatles' families, so we played them to Paul, to Ringo, to Yoko, to Olivia Harrison, and they gave the green light for the whole thing to go ahead. There wasn't actually that much politics, it was just 'Does it sound good or not?'" Wasn't Giles slightly intimidated by the thought of setting to work on the Beatles' masters? "Yeah. But I didn't believe it was going to happen, to be honest. When I first came to Abbey Road, in people's eyes they were looking at me thinking 'You're only going to get so far into doing this.' Because it's kind of like the Holy Grail. I thought it was never going to see the light of day, so that kind of helped me. I just launched into it without worrying too much, presuming that things were going to go wrong. The funny thing about Beatles stuff is that if the Beatles aren't happy, then no-one hears it. There's no A&R teams or record companies, there's only them and my Dad involved, so it kind of makes it easier in a way. The pressure is really whether you are gonna get fired or get the job!" Once he'd secured the job, Abbey Road engineers set to work building a studio to Giles's specifications ("Which is always nice," he laughs). He chose to work in Pro Tools ("They've only just updated me — I was on 6.4 for ages") run on a Mac, using Adam S3A monitors ("They're the best cross between nearfield and big studio speakers"). Photo: BBC Library/Redferns The Love project began life as the soundtrack for Cirque du Soleil's Las Vegas show.His first task when work got under way properly in 2004 was to load almost all of the old Beatles' one-inch four-track and eight-track masters into Pro Tools. "I realised that none of the Beatles' tapes had been backed up properly at Abbey Road, so I thought that might be a good idea! It also gave me a chance — and my Dad, to be honest — to listen to all the stuff again. So we went through everything, and we did it by album. It's catalogued as albums, singles, 'B' sides, miscellaneous. We listened to absolutely everything and backed it up. Everything that's been released we loaded up. We wanted to use the best takes possible, trusting that my Dad had chosen the best takes before, and also to use as many elements of the songs as possible. The way the Beatles worked is they'd lay something down and if they weren't happy with the take, then they'd lay nothing more on top. "We were trying to keep a clean signal path, so we just went straight from a tape machine into Pro Tools. The whole idea was to copy the tapes as exactly as possible. I had a Pro Control desk as a way of having faders for my Dad. We kept on running out of RAM after a while. The funny thing is, even if I'm compiling songs, I'm not really going above 16 or 20 tracks. So I didn't really need as much as perhaps someone making a modern record." Critics of the choice of material on Love have pointed out its bias towards mid-to-late-period Beatles. There is, however, as Giles insists, a fairly obvious technical reason for this. "The earlier stuff is sonically similar. It lacks the imagery the later stuff has. Bearing in mind we're doing a show, 'Lucy In The Sky With Diamonds' lends itself more to a visual thing perhaps than 'I Should Have Known Better'. On top of that, a lot of the earlier Beatles stuff has no separation on it at all. We were pushed by the Beatles to change things: they wanted experimentation, and you can't really do that with the earlier stuff. A lot of people say to me 'Why didn't you use the drums from this?' But there's only a certain number of clean drum tracks in the entire Beatles catalogue. There's not much stuff from Let It Be, because it's all live with no separation." In returning to the earlier masters, Abbey Road's Allan Rouse came up with a suggestion that would help shape the sound of songs like 'Eleanor Rigby': going back to the original, unbounced masters as well as using the mixed-down four-tracks. "We would sync up the fours to fours," Giles says. "So 'Eleanor Rigby' was recorded originally on a four-track one-inch as a double string quartet, and then we'd sync the bounce of the strings that was done, so we could then have a six-track of a four-track." The Martins set themselves two fairly severe rules for the creation of Love: never to loop the drums or pitch-change the voices. And they managed to stick to them. Almost. "We mucked about with rhythms," says George, "but we never sampled anything, we thought that was wrong. 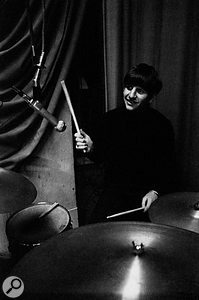 We wanted to keep the performances, particularly in the rhythm sections, so that if you hear Ringo playing, it's Ringo playing. It's not a sample of one bar and then repeating it. The only thing that was anywhere near [a time-stretch] was 'Octopus's Garden', because we had to chop it up into pieces so it fitted a slow orchestral section at the beginning, which it wasn't designed for. But it worked very well." "Of course," Giles goes on, "On 'Within You Without You/Tomorrow Never Knows' the voice has been stretched. The screams in 'I Want You (She's So Heavy)/Helter Skelter' I put down a tone. The end of 'Strawberry Fields' has been looped, but after a very long period of time, and there's a slight loop in 'Drive My Car', but generally it's them playing. When I started doing it, I was using modern techniques, as it were. I put a tempo map out which was 122.5bpm and put in the drums from the intro of 'Get Back', and then put 'Get Back' in time with it and it just sounded like I'd removed all the soul from the Beatles." 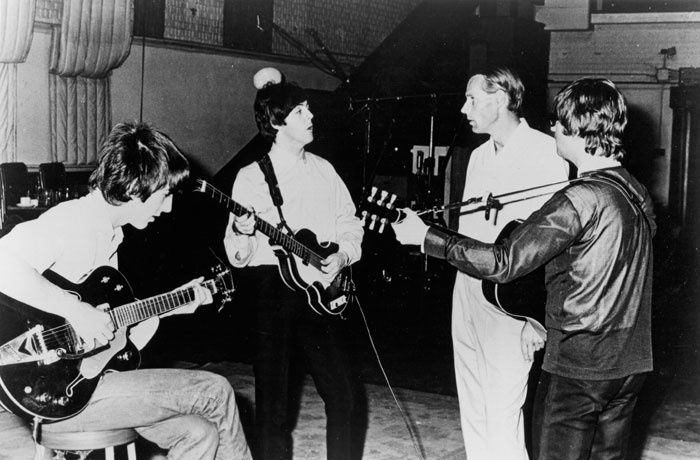 George Martin in Abbey Road with George Harrison, Paul McCartney and John Lennon.Photo: BBC Library/Redferns"Another complication," George adds, "was that a lot of the recordings I did with the Beatles we used to record at different speeds. Not necessarily at half-tone intervals, but just a wee bit off. You know, maybe instead of being 60 cycles, we'd be 59 cycles, or 61. We didn't care too much about tuning, about making the things work together and run into each other. So when we came to merge these tracks, sometimes they were out of tune with one of the other ones. So one of my jobs was to physically tune them, bring them into pitch, just slightly up or down to make them work within the limits of the even-tempered scale." Giles remembers: "With 'Here Comes The Sun', I realised that the original was much brighter-sounding, and it's actually up a quarter tone. So I went back and reimported everything at a quarter tone up in order to make it like the original. So we did actually keep to the originals as much as possible. 'Here Comes The Sun' not sped-up sounds like a different record. It makes such a difference, varispeed." One happy accident occurred when the pair pasted a live recording of 'I Want To Hold Your Hand' from the Hollywood Bowl over the studio master. "I wanted to use the Hollywood Bowl recordings, the atmosphere of the Beatles live in the early days," George explains. "But they weren't awfully good from the point of view of the technology. So we overlaid the studio recording on top of the Hollywood Bowl recordings, which meant matching every beat so that you couldn't tell the difference. Giles painstakingly plastered in each beat, and the result was that we got the Hollywood Bowl recording with all the tremendous screams in the audience and these great sounds." "It probably took about three days," Giles says. "The funny thing is you had to do it before you realised it was going to work. The Hollywood Bowl sits behind the other one. It's amazing how loud the screams are." Of the more traditional restoration mixes on Love, tracks such as 'I Am The Walrus' and 'Being For The Benefit Of Mr. Kite!' come across as less psychedelic, revealing the band arrangements more. Starr's drums and McCartney's bass, in particular, enjoy more 21st century punch. "I love his bass lines," Giles enthuses. "In fact the bass took a lot of work. McCartney's bass is such a great sound, so myself and [remix engineer] Paul Hicks re-looked at it because I wasn't happy with it. We didn't get it quite right at the beginning. For 'Walrus' we could suddenly open it out — we had nine tracks or something to play around with — there's two drum kits. I think the original is really nicely claustrophobic and ours is more of an in-your-face rock number." Revisiting 'Mr. Kite' reminded George of the incredible work that had gone into creating the effects on the original. "John was never definitive," he remembers, "he lived in a kind of dreamworld. He would have an adjective, he would talk about 'orange sounds'. With 'Kite', he said 'I want it to sound like a circus, I want to smell the sawdust.' I said we should have a calliope and he was thinking about the Magic Roundabout signature tune, the little pipey sound. I said 'Yeah, I was thinking of the little organ that the seven dwarfs played in Snow White.' We laid it down with organs first of all. The double-speed technique came in because I couldn't handle all those chromatic runs at real speed. Then we cut the steam-organ tapes into 18-inch sections, threw them up in the air and joined them up again. That was the background mush that made the thing sound effective." The elder producer admits that, particularly around the time of Sgt. Pepper, he found himself in a more experimental mood which matched the ambitions of the Beatles perfectly. "They were continually coming to me saying 'What can we do here, George? What other instruments can we use?' I would show them how to do backwards sounds or how we could edit things and make them different and change the speed of the tape to give us a different sound on the bass drum. They wallowed in this, they thought it was great. The backwards sound, the first time I used it was on 'Rain', and when John heard it, he didn't believe it was his voice and they loved it so much they wanted to do everything backwards." In terms of modern effects for Love, was Giles at all wary of using digital reverbs and delays? "We'd use mostly all old gear, just because it sounds good. The only digital thing we used a lot of was Waves' Z-Noise. It's really good at taking hiss off tracks. On 'While My Guitar Gently Weeps', we used that on the vocal and guitar and it gave us more of a dimension without affecting the sound. We used the old plates in Studio Two, we used the old compressors, the Neves, the Fairchilds. We used a lot of the EMI EQs in the desks and there's a company called Chandler who make copies of the EMI limiters and compressors and we used a couple of their things as well. We just tried to keep it as analogue as possible. We used the original delays. Occasionally we'd rig up a tape delay or we'd just use the Pro Tools digital delay. All we were looking for was something really simple. Sometimes we'd ADT things using a tape machine, the same way that it was done 40 years ago." Given the nature of the project, of course, there are hardly any new sounds or recordings on Love, apart from the birdsong atmospherics that backdrop 'Because'. However, George Martin did write a new string arrangement, recorded at his AIR Studio in London, for George Harrison's demo of 'While My Guitar Gently Weeps'. George recalls: "Dominic Champagne, the director of the show, loved George's demo recording of 'While My Guitar Gently Weeps', and it is very touching. It's in a lower key than the master; it's also slower, much more gentle and shorter. He wanted to put it in the show and Olivia didn't think it was good enough — it had always sounded what it was, a demo, she said. It was done here, take three. So this was a revival and Dominic said 'Well, what if we make it more official? Why don't we ask George to write a score?' I was put on the spot, y'know, because his widow is going to listen to it... But she did love it, thank the Lord." When it came to the mastering of Love the album, Giles opted for both digital and analogue approaches. "We were running at 96k for the whole project and we mastered onto Pro Tools, but we mastered on two-inch eight-track as well, and we ended up using the tape and not Pro Tools to cut the album, because it sounded better. Tape seems to join sounds together in the way that digital gives you separation." The audio production for Love, the show, was a more complicated affair. 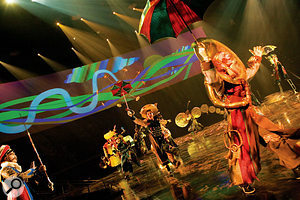 Giles travelled to Montreal, where Cirque du Soleil were rehearsing the show, and then to Las Vegas, where a purpose-built theatre had been erected at the cost of $120 million. In both locations, the Abbey Road studio had been replicated almost to the millimetre. "The funny thing is I'm fairly slapdash," Giles states. "I'm very perfectionist when it comes to sound, but studios are just a space to work in. They'd measured everything and put my piano in the same place, even my old Yamaha beatbox that I use to tap tempos. It was like walking into the Giles and George Martin museum. Then they had the same thing in the Mirage in Vegas. I had hand-recognition systems to go into my room because of the security around the Beatles' drives." The Love auditorium boasts 360-degree sound through 8000 speakers. A mixing nightmare? "It's done in sections. We'd mix at night off laptops and then we'd bounce our mixes onto a 16-track Gigasampler, all the effects and everything. It means that we can have things flying around your head. For 'A Day In The Life', we have left and right in the headrests and a centre speaker in the seat in front of you, so I stuck John's voice right in your head and the band 50 feet away, up in the rafters. It's the same principles as 5.1, but a lot more outputs." Giles admits that the hairiest part of the project was letting the ex-Beatles hear the results of his three years of work. "With 'Lady Madonna' I put 'Hey Bulldog' in the middle. I remember thinking 'What's Paul going to think?' Because he arranged the song. And he said 'That's the single, that's cool'. We played him stuff loud in the theatre and he said 'You've taken our music and you've been so sympathetic with it and yet you've added stuff to it that I wouldn't even think of.' So we went out and got absolutely hammered. Well, I did, anyway." George Martin reckons that Love will be the last airing for the Beatles' masters: "I would think so. It'll be my last for sure." His son, however, begs to differ. "I don't know... he's lied before about this stuff." Even if he has clearly enjoyed the process of putting together Love, George Martin insists that he isn't one for nostalgia. "Not really. I don't really look back, I look forward. In fact, until we'd decided to do the Anthology, I hadn't really listened to the old stuff at all. You don't dig 'em out and say, 'Let's listen to this again.' You've done it, you move on. So there's an awful lot of records I've made which I have a great affection for... but in the main I don't go back." It's a measure of Martin's characteristic modesty that even as an octogenarian he still can't quite get his head around the fact that he's regularly named the most successful and influential record producer of all time. He shakes his head and chuckles at the memory of the PLASA (Professional Lighting And Sound Association) show at Earl's Court that he attended last year. "I was there for a purpose," he recalls. "I had to present an award but also [he laughs] I was on the scrounge for stuff for my Montserrat auditorium. As I walked through the show, people would come up to me and say 'Can I shake your hand?' And that's a bit cringe-making really. I say 'Well, that's very kind of you, thank you very much.'" Ultimately, it seems, George Martin, like the rest of us, is still trying to get to grips with exactly what he achieved with the Beatles. He allows himself a polite laugh. "In the end," he says, "it's quite difficult to come to terms with, really."